A couple of weeks ago, I caught numerous small dolphin fish around 50-55cm off Port Stephens. Good fun but undersized. I know they grow quick because Scratchie and Woodsy got a few at the FAD on Monday at 59cm. Well, I’d like to thank Scratchie and Woodsy for fattening them up for me! 🙏😂 I made my first ever trip to the FAD today and had a ball! I left the ramp just after 5am and cautiously headed for Cabbage Tree Island in the dark. Got plenty of slimies and a few yakkas then headed for the FAD. It was a fairly slow trip as the sea was sloppier and the wind stronger than I had expected but I took my time and trolled a couple of skirts on the way. Its quite a way out to the FAD! Picked up a bonito on the way and a legal dolly as I approached the FAD, both on purple skirts. I then proceeded to have a lot of fun casting soft plastics around the FAD on my Shimano T-Curve 3 piece travel rod that I normally use for snapper. I released 3 or 4 just undersized but managed another 4 legal to 81cm. The 81cm model really tested out that T-Curve and making the gaff shot solo was a challenge, too! The best bites appeared to be just before the wind picked up ahead of a rain squall... and there were a few of them! That rain stung! There were 3 or 4 other boats there but they appeared to be using livies. The lure that did the damage for me was a 7 inch Zman jerk shad in coconut ice. 😉 With the wind picking up, I decided to head for home about 10:30. However, as I got closer inshore the weather improved, so I tried a flathead drift in an area that worked well for me this time last year but did not meet with the same success. Eventually got back to the ramp at around 1pm. Gotta love Port Stephens! On a footnote, my outboard’s running great now but my Humminbird sounder is really starting to give me the irrits! 😡 It’s giving weird readings - sometimes too deep but mostly too shallow - out around the FAD the depth alarm was almost continual. I don’t know whether it’s the transducer or the head unit! 2nd problem was that all my live baits died. For some reason, the pump stopped working. But it seemed to work fine when I got home! Go figure. G’day raiders, Well, I was thinking we might make a trip up to Crowdy considering all the good reports from the area but we decided to fish our own backyard as reports of longtail have been coming in. Woodsy and I were first at the ramp and first to the bait grounds. Loaded up with slimies amd off we went. Got to our spot and tried drifting for a few snapper first but kept a livie drifting behind us. No luck on the snapper but the livie starts to scream off. Shite, we found one already and we haven’t even set up properly yet. After a good fight on lightish gear up comes a nice 8kg plus longtail. Sweet donut broken and hi5’s all round. Next we set up and deploy the balloon floaters and didn’t have to wait long and Woodsy’s rod lights up! This thing is in a hurry, so much that it took nearly 300m, pulled the hook and kept going. I didn’t even get a chance to lift the anchor! Boy these things move fast. Set up again and whilst we were waiting a started casting metals and was hooking up on every cast, bonito, Mac tuna and having a ball. Then another livie gets smashed and pulls the hook. By now the wind was getting up and we made the call to move. Good decision, we set up the bigger rod this time and lucky we did! It got nailed and Woodsy was in for a fight. After a good 10mins with this rod past sunset a gaff shot was in sight and onboard comes a solid 12kg plus longy! Yewww After that, we lost another and callled it quits as the wind was now gusting and we already had enough to bring home! Yet, another beautiful day in Port Stephens! Thanks for reading, Cheers scratchie!!! Not sure what happened here. I spent 15 minutes typing up a report but the text disappeared when I hit post.... EDIT: OK, no idea what happened so I’ll try again…. After all of my recent reports have been freshwater it was time to put in a day on the salt. So yesterday morning I met up with a couple of mates and by 6.15am we were launching at the Roseville ramp. 1st stop was the FAD off Manly, when we got there there were already 3 boats drifting around so we joined in dropped down cut pillies and squid baits as well as throwing around some soft plastics. We soon hooked into a small Dolly, over the next 45 minutes we caught 4 Dolly’s but as they were all quite small they went back in and we decided to head out to the wave rider a mile or so further out. There was only one other boat there but after drifting past the buoy a few times we were not able to entice a single hit. Time for plan B. This was to head around 8 or 9 miles North to some marks shown on the navtronics app on my mates phone that looked to be a couple of buoy’s… Wrong they were only GPS marks. So as we were all the way up there by Mona Vale we decided to drift around and see what we could pick up. Turned out to be a reasonable decision as over the next hour or so we caught a selection of Red’s, Flathead and Morwong. Lot’s of small ones but we started to get a few fish on ice. After that we headed back South to an area just North of Long Reef where there are 4 wrecks showing on the app. Down went the paternoster rigs again with pillies and squid and much like the first spot up came a selection of Red’s, Flathead and Morwong. Again lots of small ones but we did manage a nice sized Red and a real good sized Morwong. Eventually we decided that it was time to start making our way back towards home but could not resits another look at the Fad…. Turned out to be a waste of time but hey you never know if you never go….. Finally my mate said that he wanted to stop off at one of his favorite Flathead drifts for our last few drifts before home. By now the wind was starting to pick up a bit so even though we were only fishing in around 50m of water we had over 100m of line out to get a bait to the bottom. Then we hooked onto the fish of the day.. This Flathead drift had already produced a couple of small Reds and a Morwong then my Mates rod bent over with a solid fish. Took him a good few minutes to finally coax it to the boat and as I leaned over with the net a lovely Jew Fish came to the surface. Into the net and onto the ice, a good 85cm + fish. With that we headed back to the ramp with a reasonable catch on ice and all feeling quite tired after a long day on the water. Dinner last night was one of my favorites, Flathead fillets rolled in a flour and Cajun spice mix and shallow fried, served with garlic mash, peas and corn… Followed by a sleep in the arm chair after dinner. I must agree with @dirvin21 outside the hospital setting it is about the quality chest compressions. I can tell you as a clinician and a cardiac arrest survivor it is the chest compressions that do the trick. Just yesterday it was 9 years since I had a cardiac arrest. Stewy saved my life as I stopped breathing and had no heart beat. He had the NSW Ambulance on the phone and they told him to commence 400 compressions and no breaths. Paramedics arrived and defibrillated me. Here is my trophy - one that no one wants to win really. Stewy saved my life - he is my hero. Sorry for the lack of reports everyone, have to admit I haven't been getting out there very much lately. Theres a few reasons why, firstly I've been busy working on my coxswain course. This isn't something I really planned to do but the fact my daughter was doing hers, I figured why not share the driving back and forth to tafe. The fishing has still been pretty hit and miss down here, yes the kings are going off their heads some days but most of the time just one or two boats get them a couple of days per week. The snapper grounds frustration is still loaded with leather jackets, which proves very costly every trip. I'm looking into using full single strand wire on future snapper trips, will just have to see how that goes. 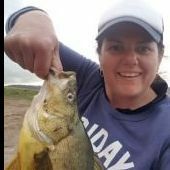 My fishing, diving and general kick around buddy now has her P plates and far more enthusiasm for all fishing tham me, to the point she has sponsors and even represents Aus in the underwater hunting. Just because I'm not getting out doesn't mean my daughter is missing out at all, in fact she's working on the best local charter boats down here, then heading out bream fishing everyday on her own. This weekend she's fishing Eden and Mallacoota, to the point all her awake hours seem to be fixed on hunting down fish in one way or another. I must admit it's not a bad thing at all not having the pressure of chassing fish so much, got a few trips planned with a like minded mate coming up which I'm looking forward to. Just noticed in a thread which has been shut down where someone was under the misunderstanding tailor don't grow over 4 kg in NSW, which is completely wrong. We've had them to just under 7kg from my local beach and others have been weighed during local comps over 7 kg. Unfortunately I can't get to the one my daughter caught during a comp a few years ago as it's on photobacket, however here's a shot of one over 4kg taken on plastics and 4lb line bream fishing recently. Just north of us in the JB area tailor of over 7kg are regularly landed. The biggest tailor I've personally seen have been around the norther solitary island on the north NSW coast, these have been around the 10kg ( in sanctuary zones). They can reach 120cm 14 kg on the east coast, according to fishing world. 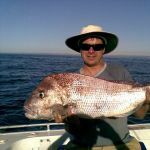 Ive caught some consitant bigger fish in western Aus around the Kalbarri area but I can assure people there are a few on the NSW coast too. Hi. "Long Time no see". We had yeastarday First icefishing session on this Winter. Vili And Saija catch most fishes, andt Veikka catch biggest. All fishes Was quite small, but weather Was nice. We just came Back from second short fishing session with Veikka And Saija, Vili IS on school. Next Week More ice fishing, If ice not melt too fast. Slinky's daughter is coming fishing with useallso, hope that catch some even little bit biggest fish's then. hi raiders one of my bff got a new boat (surtees workmate 495 with 60hp) and he asked me if i can show him some fishing spots. finished work around 130am packed my fishing gear and got to my mate around 4am. got to the ramp around 5am and decided to catch some bait at clifton. spent around 30mins trying to catch some bait but with no success so decided to troll north head. trolled for around 2hrs for 1 bonito and 2 mac tuna. bonito was caught on the mackbait redhead and 2 mac tuna on the banana mack. decided to go to balmoral and try catch some bait. spent around 1hr at balmoral catching baby snapper bream flattys and 1 kingy(60cm) on chicken strips and pilly cubes. wind started to pick up around midday so decided to head back to the ramp at drummoyne. took a while to come back to the ramp and had to wait at the ramp for a while because a boathire company left 1 boat at the ramp while he got another boat. got home around 6pm. went to bed around 8pm. its a very long day but worth it. the new boat was excellent. hoping to go outside the heads again soon. thanks for reading. 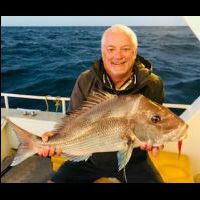 btw, one of my bff went trolling last friday 22/3/19 at north head and caught 5 bonito and 3 mac tuna. 2 of my bff went fishing botany bay 23/3/19 and caught 2 legal kingys around molli point. still plenty of rats at the bay atm.